Rapid sequence intubation, the simultaneous administration of a paralytic and induction agent immediately followed by laryngoscopy, provides the optimal view of the glottis and prevents emesis. 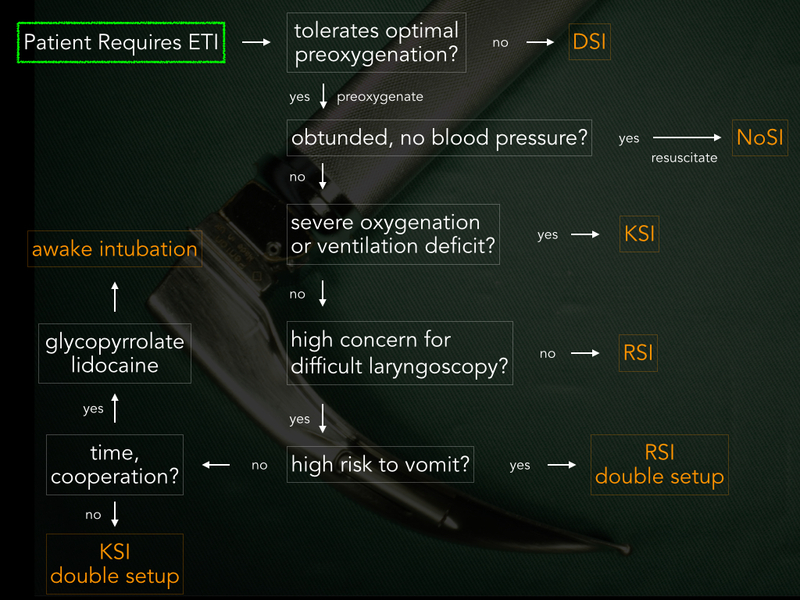 RSI is the best strategy for most patients who require intubation, but not all. When you’ve decided to intubate, first maximally preoxygenate. If the patient will not cooperate with your preoxygenation plan, even after you’ve asked nicely, that’s your cue to add cooperation in a vial, ketamine, and then oxygenate, before you push the paralytic and intubate. This is delayed sequence intubation. Otherwise, carry on with preoxygenation, and consider a couple of special situations. The first is the patient who is about to arrest–obtunded, no blood pressure. Any induction agent will cause sympatholysis which, along with the transition to positive pressure ventilation, may precipitate arrest, so ideally we would avoid both while the patient is in the state of nearly arrested. Resuscitate aggressively with fluids, vasoactive drips and treatment of the underlying problem for as long as you can before intubating. If you must intubate the patient who is obtunded with no blood pressure, the safest way to do it is often without any drugs at all, while the patient continues to breathe. If you have to give meds, dose sedatives low and paralytics high. The next special situation is the patient who has a severe oxygenation or ventilation deficit. The severe oxygenation deficit patient saturates less than 90% on 100% NIV; the severe ventilation deficit patient is compensating for a severe metabolic acidosis, e.g. DKA with pH 6.7. In patients with a severe oxygenation or ventilation deficit, even a brief period of apnea is very dangerous, and since paralysis is certain to cause apnea, it stands to reason that paralysis may not be the best approach. However, these patients are very ill, so conventional awake technique, which requires time and cooperation, will not work well. If only there were a drug that would immediately render the patient tolerant of laryngoscopy, while ventilation and airway reflexes are preserved. Ketamine-supported intubation, KSI, is pushing an induction dose of ketamine over 20-30 seconds, then performing laryngoscopy. KSI is awake intubation with minimal or no local anesthesia, or, if you prefer, RSI without paralysis. By omitting the paralytic, KSI carries a chance of two harms: suboptimal view of the glottis, and emesis/aspiration. I address these harms in detail in this discussion; the advantage in glottic exposure offered by paralysis is less significant in the era of video laryngoscopy, which almost always provides a great view of the cords, and the risk of emesis/aspiration is very small most of the time. In any case, these harms must be weighed against the harm of apnea for the patient in front of you. Others have described a similar strategy, augmenting ketamine with etomidate as necessary. The last and most important special situation is high concern for difficult laryngoscopy. You assess all your endotracheal tube-requiring patients for difficult laryngoscopy, either intuitively or explicitly, and most of the time, you think, I got this, in which case, carry on with RSI like you always do. But if you think it is likely that laryngoscopy will fail, and the patient is presently benefiting from their own ventilatory efforts, abolishing those efforts with RSI may not be the best choice. Even in scary laryngoscopy cases, RSI is probably still optimal if the patient is high risk to vomit (has been vomiting, upper GI bleed, bowel obstruction). In these scenarios, the protection against emesis afforded by paralysis is compelling, so proceed with RSI, but use a double setup, with your partner on standby, ready to cut the neck. Keep the head of the bed up and drop an NG tube in beforehand if you can. The patient whose airway is a lawyer’s dream and isn’t a particular risk to vomit is ideally intubated without a paralytic, while continuing to breathe, awake intubation. Awake intubation has two pharmaceutical arms: local anesthesia, and systemic sedation. The more cooperative the patient and the less urgent the airway, the more you can rely on local anesthesia. So if you have time and cooperation, dose glycopyrrolate or atropine, then generously nebulize, topicalize, and atomize lidocaine, then you can slowly, carefully do your laryngoscopy, or flexible endoscopy, or whatever you want, as the patient is awake and breathing. In the OR, where patients and physicians are stable and cooperative, patients with concerning airways are intubated with minimal or no sedation at all, which affords an enormous margin of procedural safety. Patients being intubated in the ED are of course neither stable nor cooperative, but a similar degree of safety can be achieved using ketamine: the less time and less cooperation, the less lidocaine, the more ketamine. In the extreme version of the emergency department awake intubation, give induction dose ketamine and go: KSI. Consider KSI for your severe oxygenation/ventilation deficit patients, but also when you are concerned that laryngoscopy is going to fail and the patient won’t cooperate with, or you don’t have time for, a more civilized, operating theater-type awake intubation. Have a paralytic ready in syringe, in case you want to convert to RSI at any point, and incorporate a double setup component to your approach, because your concerns about laryngoscopy might turn out to be well-founded.